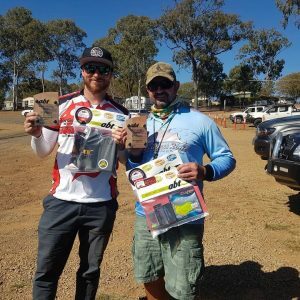 Charles West has closed out the perfect season with his fifth win of the 2017 ePropolsion Bass Electric season at Moogerah Dam and accumulated a perfect 500 out of 500 angler of the year points. In the process he took his third win in as many years at Moogerah Dam showing he is the master of the lake in tough conditions as the only angler to weigh his full limit with 2/2 fish for 1.05 kg. Hot on his heels was his fishing partner Adrian Wilson, who caught the only other legal fish for the tournament at 0.64 kg and the event big bass. With tough conditions greeting anglers West knew it would be a grind to fill his limit. Having found good concentrations of bass holding tight to the bottom at the spit on prefish day, he and Adrian Wilson started the session fishing a mixture of deep plastics close to the bottom. “Once we dropped our lures to the bottom we could the fish light up but we could not get them to bite” said West. The pair kept moving across the main point of the spit looking for fresh fish to target, they began to boat undersized fish and knew it would be a process of grinding through fish to find the legal fish within the school. “We started to catch fish as the session went on and began to get lots of fish to follow the lure but I just felt I needed something annoy the bigger fish into biting” said West. Having fished Moogerah for a number of years West dipped into his bag of tricks and pulled out an old favorite, a silver and orange Nils Master ice jig. While it did not produce instant success, West persisted and began mixing up the retrieve to entice the fish. “I would hop the lure close to the bottom which would activate the fish, once I could see the fish holding off the bottom I would slow roll it up just out of their reach and then hop it again, I found this kept the fish interested and they would eventually bite” explained West, who went on to explain the key was to not strike on the fish until the rod had begun to load up. Wests tackle of choice was a Valley Hill Raison Jaburo 65L spin rod, matched with a Daiwa Certate spooled with Sunline Castaway 10lb and 6lb Gamma FC. 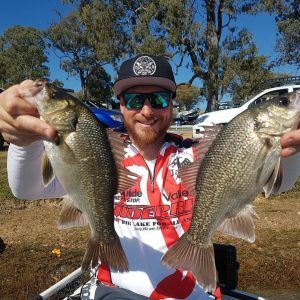 West’s fifth win of the season caps off an incredible season for the Brisbane based bass angler as only the second angler in ABT history to score a perfect 500/500 angler of the year score and the first bass angler to complete such an astonishing season. When asked about the key to his season West put it down to confidence and trust in himself and his fishing partner. “It has been an amazing season, from a slow start it has been a crazy year. I have had such a great time fishing with Adrian, we always have a great time on the boat” said West. He was also quick to thank his sponsors Valley Hill, Costa, Pro Factory and his family for their ongoing support. With his second podium finish in as many events, previous AOY winner Adrian Wilson has continued his stella finish to the 2017 season taking second place and big bass with 1/2 fish for 0.64 kg. While West kept his presentation subtle and kept his lure in the face of the bass Wilson opted for a more aggressive approach. Casting a 15 gram silver Halco Twisty across the school before ripping it off the bottom in an effort to entice the fish to bite. “I would mix between the aggressive approach of the twisty and a grub, each time we would get to a new school of I would start out with the Twisty. Ripping it to wake up the fish” said Wilson. While the pair caught between 10 to 15 fish for the tournament, Wilson was unable to find his second legal and complete his limit. “As always it was a great day on the water, I just couldn’t find the second fish for my limit” explain Wilson. For this work Wilson used a Barra Bass XP843 Baitcaster matched with a Daiwa Steez spooled with 20lb Super 8 PE and 8 lb FC Rock, Wilson also made the key adjustment to his Twisty by adding assist hooks to make the most of every bite. Attention now turns the convention in late October, can West put an exclamation mark on his season or will someone else take the title at the convention. 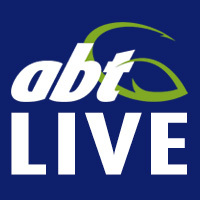 Stay tuned to abt.org.au for all the news and tournament results.